I’m a wine drinker. But, in my quest to learn about all types of alcoholic beverages, I have found a love for single malt scotch, liqueurs, vodka, tequila, rum and more. 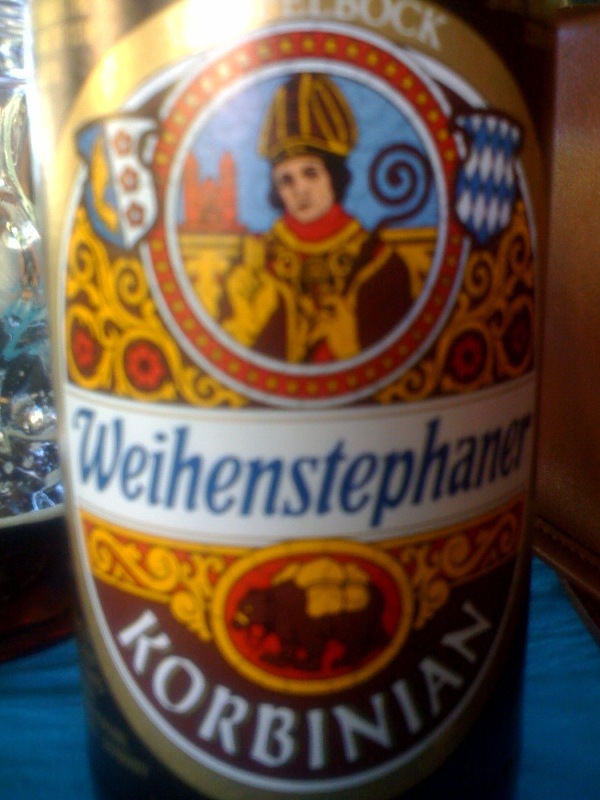 In the mix, I discovered a love for beer only after attending Munich’s Oktoberfest. And, like enjoying fine wine, the people and the atmosphere definitely add to the enjoyment. 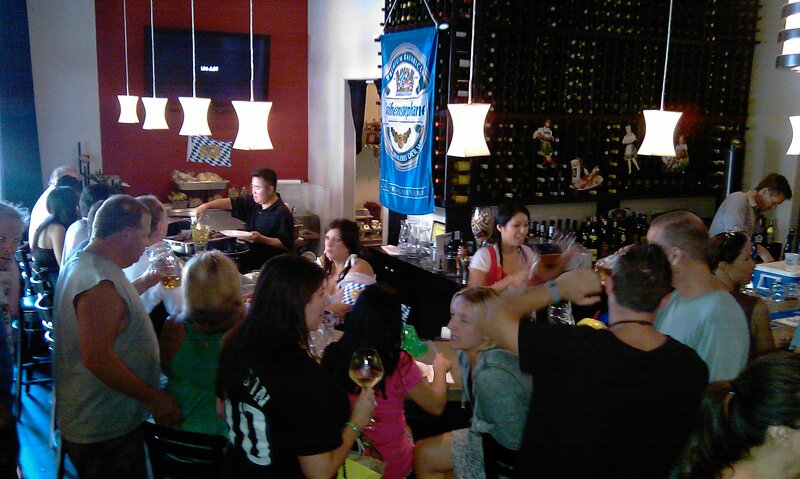 Fast forward to a rare event at Lee’s Wine Bistro. I tease Yoon Lee, the owner most just call “Lee”, because he’s not much into events. But, when I came to his Oktoberfest last weekend, he said he would be doing more. Lee's group shot, photographed by Nena Quick. For Lee’s Oktoberfest he asked Wendy Roberts, of Wine Warehouse, for help. She in turn, brought in Tim Lynch, of Total Beverage Solutions, to provide a fine selection of beer from a brewery that dates back to 1040. The Weihenstephaner beer brand has placed in the top five by Beer Advocate; kind of like the Wine Spectator for beers. 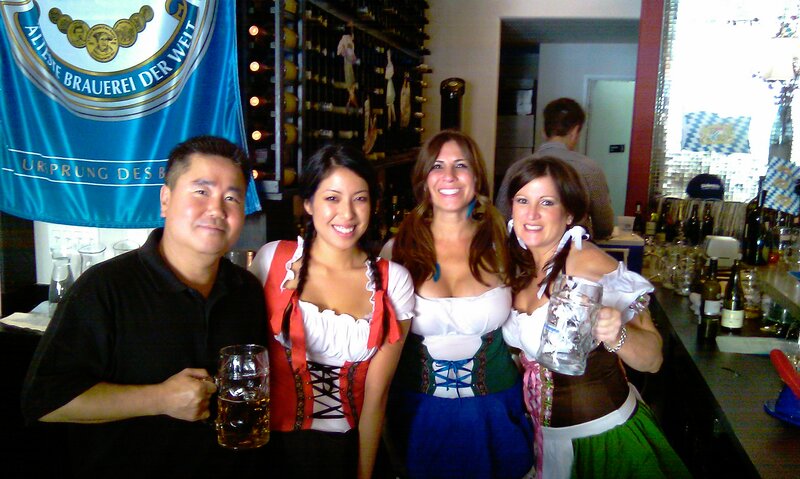 That day at Lee’s guests enjoyed a full line-up from Weihenstephaner. By the Keg was: Kristall Weissbier, a crystal wheat beer and Festbier, a full, rich bodied, hoppy seasonal beer. By the bottle we had Vitus, a light colored, spicy single bock wheat beer and Korbinian, an extremely dark colored doubled-bock beer, for stout beer lovers. I fully intended to have two to three beers. (That proved to be a problem.) I asked Wendy for a suggestion and she said the Korbinian was outstanding. Knowing I was starting with the deepest…it isn’t a wonder I couldn’t get any further. I was delighted with the beer. Having recently watched a tour of the Guinness brewery via The Thirsty Traveler cable TV show, I knew that the foam on top was also something to be tasted. I got coffee grounds, chocolate, lots of hops with a deliciously long length. Lee’s Wine Bistro: Go bug him, he said he’d have some classes coming up, if not remind him Oktoberfest can be repeated! 661-259-7754.